Last Sunday our club, Lions Club of Mombasa Bahari went to to a remote village for the opening ceremony of a bore well. This was the 3rd bore well that the Club had constructed with the help of generous donors. As soon as we reached the village, what struck me was how simple life is in these remote villages. No electricity, no water, no complicated or complex buildings… actually nothing except for huts, lots of trees, greenery and cattle. When we have to stay without power for even an hour, we get frustrated and life comes to a standstill when our taps run dry. These villagers live without all this. Women, girls, young children have to track long distances to get water. Boys may have to look after cattle. Children as a result cannot attend school. We are hoping that by digging a bore well, the villagers will lead better lives and children will be able to attend school. The villagers entertained us with some traditional dance. Their musical instruments were simply bottles filled with beans and pebbles. The magician had quite a few tricks up his sleeves. He just used basic everyday gadgets, bottles, paper, pot, bowl, knives, cloth and nothing fancy like cards, magic boxes, cylinders, puppets etc etc. We take so many things in our lives for granted. This month for the Home Bakers Challenge group we had to bake buns. Priya had given us a choice of cheese stuffed buns, Sri Lankan seeni sambal buns, Iyengar bakery khara buns and dark chocolate buns. I straight away knew the buns I wanted to bake. The savoury ones. 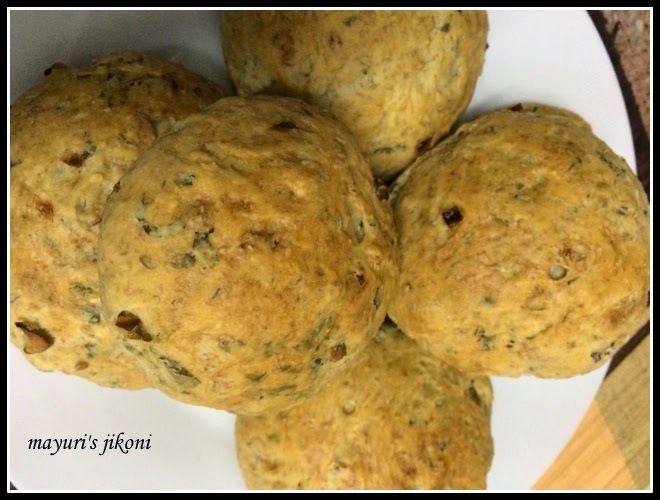 Many of the Iyengar bakeries in Bangalore sell these eggless savoury buns. They are treat to have especially when topped with loads of butter. These buns have onion, coriander and chillis kneaded into the dough. I decided to also add garlic. Some bakeries add ginger and curry leaves. We had these savoury buns with some tomato soup. Had one with tea the next day. Its a nice treat for tea time. Do you feel we take so many things in life for granted? Sift 1½ cups flour with salt into a big bowl. Add sugar and yeast. Mix well. Add the water and milk and form a dough. It will be a bit sticky. Dust the worktop or board with some of the remaining flour. Place the dough on it. Using little butter at a time, knead the dough till it becomes smooth, soft and silky. If the dough is too sticky add little flour. Knead the dough for 10 -15 minutes. Grease the bowl with a bit of oil. Rub oil over the dough and put it into the bowl. Cover the bowl and let the dough rise till it becomes double in size. Mine took about 1½ hours. While the dough is rising keep the stuffing ready. Heat oil in a small pan over low heat. Add cumin seeds. Add onion and garlic ans stir fry till the onion becomes soft. Add the chopped chillis. Take the pan off the heat and let the mixture cool. Add coriander and mix well. Gently punch down the risen dough. Dust the work top with little flour. Pat the dough into a circle. Add the onion coriander mixture. Knead the mixture into the dough gently. Place it in the bowl and let it rest for 10 -15 minutes. Roll each part into a ball and flatten it slightly. Place the buns on a greased tray. Let the buns rise till they are double in size. I let it rise for 45 minutes. Brush the top of each bun gently with milk. Put the tray in the hot oven and bake the buns for 20 -25 minutes or till the buns are light golden brown on top. You can add grated ginger and finely chopped curry leaves too. I prefer to add the onion and garlic after the dough has risen the first time. When I was still new at baking, I had added garlic and onion during the first stage only and my dough did not rise at all. Make sure the coriander is completely dry otherwise the dough will become too soft. I like to leave the washed coriander on a kitchen towel for a while before chopping. Savory buns looks delicious my favorite. The khara buns look fantastic. They go really well with tea..
Love the kara buns, looks so delicious. I love these savoury buns!! These look too good! The khara buns look great. I am going to book mark it to try it out soon. I must commend you and the LIon's club for doing so many charitable deeds in Kenya. Yes they do taste good with tea. I had some with soup too. Yes simple life is best but in this age it is difficult to lead such a simple life. Thanks Mina, I am proud to be a member of one of the most active Clubs in Kenya. Do try the buns, they are delicious.